You won’t grow to reach your maximum potential unless you train smart. Smart training involves mixing up your routines from time to time, hitting the body from different angles and perspectives while realistically evaluating your goals and progress. Agonist/antagonist training is an excellent example of a regime that can provide superb results, propelling you onward from sticky plateaus. There are many, many different types of training routines that claim to build stacks of muscle and pile on strength. But, do they all work? Well, yes, for the most part, they do. The trick is to assess your short and long-term goals, then utilize the routines that work best for you and your genetics as and when you need them. Simply sticking with the same workout structure for months and years at a time is a surefire way to bring your progress to a stuttering halt. Never be afraid to mix it up and bring new ideas and techniques into your training, just watch out for time-wasting gimmicks. Putting this law into anatomical terms, this means that for every muscle that shortens, another must lengthen. For example, as the biceps contract, the triceps stretch out. It is important to note that these are both forms of contraction. When a muscle shortens under tension, it is known as a concentric contraction. A muscle lengthening under tension is said to be going through an eccentric contraction. Muscle fibers do not simply relax and stretch out, they are still working hard as they do so. Therefore, on chest day you are working the upper back to some degree, and vise versa, as the lats and other muscles work to stabilize and support their opposing tissues and the entire surrounding area. 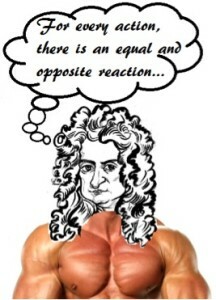 During a bench press, the pecs are the agonist muscles, while the upper back muscles are the antagonists to the motion. This is the core scientific principle of agonist/antagonist training. In order to optimize results from any training regime and diet, you need a potent anabolic environment. The primary anabolic hormone comes as no surprise, as it is the king of muscle builders: testosterone. Sheer Alpha is a powerful testosterone booster that will send your natural levels skyrocketing without any side effects…except perhaps a little extra muscle growth! Packed with potent natural ingredients such as tribulus terrestris and longjack (eurycoma longifolia), this gutsy supplement is a more than worthy addition to your stack. The Oak’s Seal of Approval! The Austrian Oak himself, the great Arnold Schwarzenegger, the builder of probably the most aesthetically perfect physique ever, is a major advocate of the agonist/antagonist method. 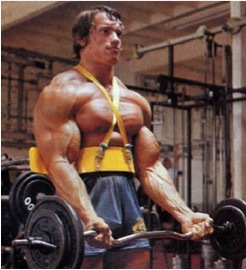 Arnie used the method to Olympia-winning success and regularly spoke and wrote of the benefits. The most commonly documented benefit of agonist/antagonist training is great increases in strength. The reason for this is easy enough to understand. With the antagonist muscles pumped and more nerves innervated, you have a stronger, sturdier platform to lift from. This means that the target (agonist) muscles can get on with the job at hand. These strength increases have been backed up by many scientific studies over the years. Working opposing muscle groups helps to build and maintain muscle balance. This keeps body aesthetics symmetrical and natural and can help to prevent injuries. This is especially important with the core muscles, where balance is paramount not just for health, but also for strength. This method can shave time from your workout schedule. Working multiple muscle groups at the same time gets things done quickly, especially when you’re performing supersets. Agonist/antagonist training ensures that all surrounding structures are sufficiently worked and warmed up, making acute injury less likely. One of the most important benefits of this type of workout schedule is that it helps to eliminate overtraining. Antagonist body parts are hit hard by heavy training, and the better your form, the more this occurs. You must have felt a little soreness in the lats the day after a big bench session? Negative reps, and partials especially, tire the opposing muscle groups as they are given a more prominent stability role. Agonist/antagonist workouts take this factor out of the equation. Instead, the work is transferred to more effective working sets for antagonist muscles before they are given much longer to rest and recover. The question now is: how do you go about working these opposing body parts into an effective workout schedule? There are a number of methods for achieving this goal. Firstly, you can simply train one group and then the other, working out the chest and then the back, for example.. This offers limited benefits, and may actually hinder the second muscle group. You can also superset, jumping straight from bench press into bent rows. While this has its uses, particularly for warming up and burning out, again, it will likely be detrimental to the second exercise. The most effective method is to take a short rest between alternating exercises, and this should constitute the bulk of your agonist/antagonist sessions. Working with opposite planes of motion is very effective as it maximizes the number of sympathetic nerves that are stimulated. When heading into a big, tough session, you need all the energy and motivation you can get. Sheer Pre-X is a platinum pre-workout supplement that will give you the boost you need without any unwanted jitters. Not only is Sheer Pre-X filled with gentle stimulants such as caffeine, it is also a powerful nitric oxide booster, meaning you’ll get the pumps to match the energy levels. Let’s start with the big one! Chest and back together. Prepare for some mirror-melting pumps! Start in the manner you plan to progress by warming up both muscle groups together. Warm-Up: Bench press and bent rows with just the bar. Move seamlessly between the two, then add a little weight and perform a superset of 20-30 easy reps per exercise. Cable Flyes/Lat Pulldowns: Two supersets, 12-15 reps.
Barbell Bench Press/Pull-Ups: Four alternating sets 6-10, reps.
Dumbbell Bench Press/Bent Rows: Three alternating sets, 8-12 reps.
Incline Dumbbell Bench Press/Seated Rows: Three alternating sets 8-12 reps.
One superset to absolute failure. Legs day is naturally agonist/antagonistic. 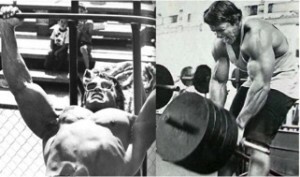 In fact, the big compound lifts, squats, and leg presses hit both quads and hamstrings heavily. Warm-Up: Move between very light leg extensions and leg curls. Squats: 1 warm-up, then 4 sets of 10-12 reps.
Leg Press: 3 sets, 6-12 reps.
Lunges/Seated Leg Curls: 3 alternating sets, 8-12 reps.
Leg Extension/Lying Leg Curls: 2 alternating sets 8-12 reps.
1 superset to absolute failure. The lateral delts really have no direct opposing muscle groups that can be used, so they are paired with the adjoining traps. Warm-Up: Move between very light shoulder press and barbell shrugs. Dumbbell Shoulder Press/Barbell Shrugs: 4 alternating sets, 6-12 reps.
Lateral Raise/Shrugs Behind Back: 4 alternating sets, 8-12 reps.
Front Raise With Disc/Bent Flyes: 4 alternating sets, 8-12 reps. Finish with a drop set of dumbbell shoulder press to total failure. You can’t go wrong with this workout. A big feel-good day. Smashing guns! Warm-Up: Move between very light cable curls and tricep pressdowns. Don’t think you’re getting off lightly here. This ain’t no namby pamby, lie on the floor core day. We’re hitting it from 360 degrees. Crunches/Good Mornings: 4 alternating sets at high reps. Hanging Leg Raise/Good Mornings: 3 alternating sets, 8-12 reps (for good mornings). Medicine Ball Side Bends/MB Twists: 3 supersets, high reps.
Machine Curls/Upper Partial Deadlifts: 4 alternating sets, 6-15 reps. These are some tough workouts, but they produce results. Try switching to an agonist/antagonist routine for 8-12 weeks, then switch it up for a different method for a while. Keep your body guessing and grow by employing a variety of exercise techniques. During tough sessions the muscles begin to break down. As the fuels are exhausted, the body starts to turn to these working muscle tissues for energy. The most common amino acids that are catabolized are the Branched Chain Amino Acids, the BCAAs. Taking Sheer BCAA before, during, and after your workouts will provide the body with high levels of free amino acid fuels, meaning that your hard-earned gains will be spared. The post Antagonize and Anabolize! appeared first on .